There are ideas and situations that are incredibly difficult to explain, unless you have the right word. When you do, it takes that complex and layered idea and makes it simple. Words like petrichor. You know the smell of the outdoors after a rain. The pleasant, earthy, yet refreshing odor that is beyond enjoyable. 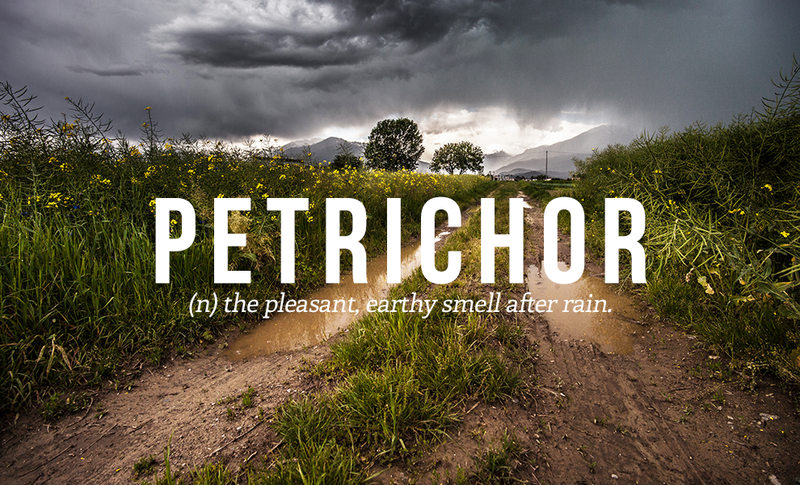 This single word, petrichor, is able to perfectly explain that complex and beautiful situation.There are so many words in the world. English words of course, but also foreign terms likeSatori and Shoshin. Words that simply don’t exist anywhere else, yet embody big ideas in a nice little package. Words simplify and provide understanding. When you are trying to explain a feeling or emotion, picking the right word makes all the difference. Let’s say you’ve been in a funk, unproductive and unhappy. Some would just call this sadness, which is a start. But if you use more powerful words, words that are more accurate, people understand things better. There is a difference between Sad and Somber. Sad and Melancholy. Sad and Grim. The connotation, the depth, the emotions all change. A great example from Scott Adams, explains how he reviews his writing to use more powerful words. If we was trying to be funny, he would try to use language that would better evoke that emotion. In his example, he talks about the word pull. Pull is a good word, but if instead he used yank, that is far more humorous. Just that simple shift, from pull to yank, gives the situation a much more lighthearted and funny tone. Be aware of how your words fit with the emotions you are trying to share. They can either help or hurt it. Finding the right words and shifts in language can greatly reinforce any message. Finally, using the right words or combination of words can paint a picture in your mind of exactly what you’re trying to say. So what do you think of when you read that? Apparently most individuals think of getting sick from eating bananas. They get a bad taste in their mouth and suddenly that banana bread doesn’t look so appetizing. Or you’re weird like me and actually visualize a banana vomiting (and of course this image exists, thanks Google). The point is, words create strong imagery in our minds and strong emotions tied to those images. While words are amazing things, we also shouldn’t overuse them for the sake of it. You know what I mean. The people who write or speak with big, fancy words that make no sense, aside from filling them with a sense of intellect. That is not the point. Words are a tool. For the most part, simple language is the way to go, but there are certain situations where that fancy word is exactly the idea you are trying to explain. It is in those situations that your vocabulary is a major asset, because those words can transform a decent piece of writing into a great one or a good speech into a phenomenal one. Now how do you find those words and build your vocabulary? Here are some of my favorite ways. The best way to encounter new words has to be by reading, a lot. Every time you stumble across a new word, look it up (especially easy on the Kindle). Slowly your vocabulary will grow and you’ll learn these words better from seeing them in action. You may think, if you don’t know the words, how will you be able to use them in your writing? Well a funny thing happens when we write. We come across ideas that we get stuck on and cant’ find the right words for. This is when a thesaurus and Google are your best friends. Hunt down that perfect word and you’ll never forget it. There are tons of word games, apps, and puzzles available nowadays and they all can improve your vocabulary. From Scrabble and the New York Times Crossword to Text Twist and Word Brain, they all help improve and build your vocabulary. This one may seem out of place, but slang words are just as interesting and meaningful, especially to a younger demographic. Often times these are the words that get added to the dictionary every year. If you’re not sure what a slang means, this is the best place to look. I have the Dictionary.com app on my phone and every morning I get a notification for theWord of the Day (today’s word is affinal meaning related by marriage). Although this is at a slower pace, I love discovering new words everyday. Bonus points if you can manage to use that word too. There are some great blogs out there that just share amazing words on the regular. My favorite has to be Other Wordly, but a quick search turns up hundreds that will help you discover words that you didn’t even know existed. So whether it’s for speaking or writing or storytelling or just casual conversation, words matter. Take the time to learn new ones.